I love maxi dresses, especially with a floral print. Dresses that feature flowers are very often our spring and summer staples. It might be a challenge to pull off, since floral patterns are full of color and shapes, but that’s the fun, right? 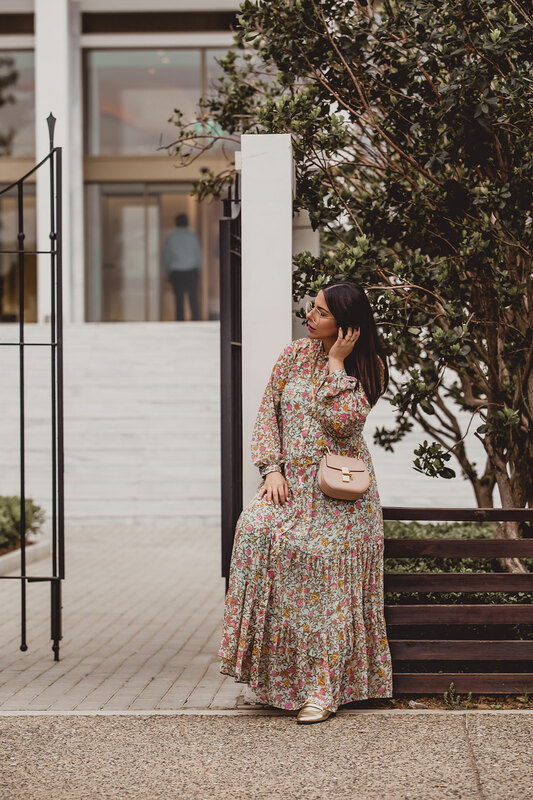 Today I show you my recent floral dress outfit, and a handpicked collection of my favorite floral dresses for this season. 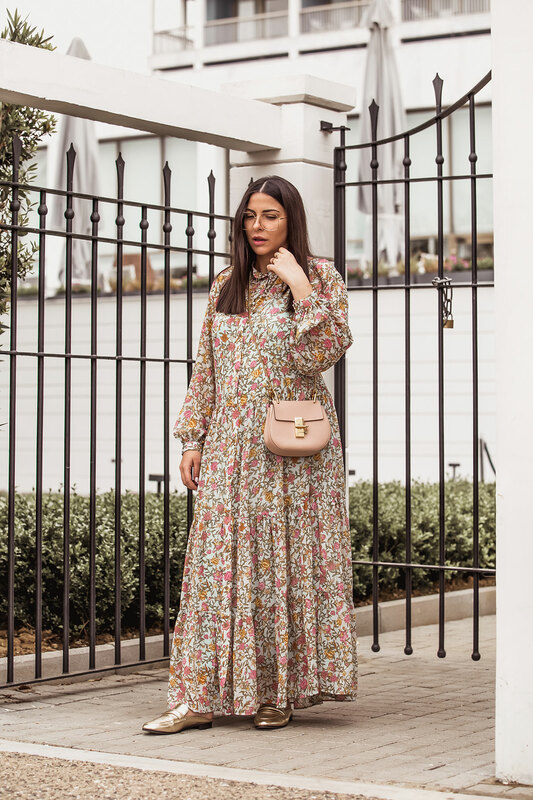 I’ve also linked some older looks with floral dresses, in case you need some extra inspiration, so keep scrolling! 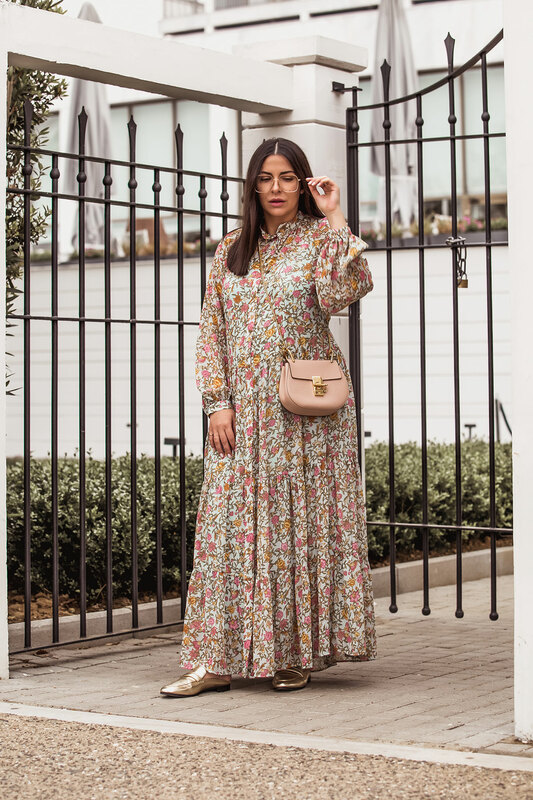 There is a vast variety of floral prints, so choosing a print and silhouette that compliments your body and style is essential. I wore this look only a few weeks after I gave birth, so the oversized silhouette was ideal to cover my postpartum belly. I used to wear such dresses in the beginning of my pregnancy too, when it was still a secret. I find that large flowers are more flattering to a petite silhouette, so I usually choose smaller patterns which give a more solid color impression. 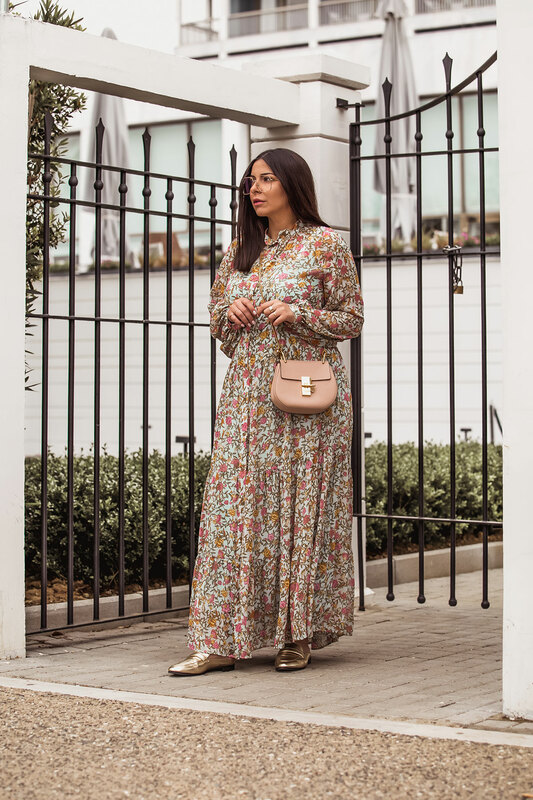 This time I styled my maxi floral dress by adding some pops of gold. These golden flat mules are my go-to when I want to add some metallic pop on my outfit, yet keep it comfortable. The Chloé Drew bag has the necessary gold accent that I opted for and the color is perfectly matching the dress don’t you think? I finished these touches of gold with my Chloé glasses that I am totally obsessed with lately! What do you think? Ooooh, aaah! Oh my goodness Stella, darling. I do not know where to begin with this wonderful post. You must be able to read my mind. you when I have calmed down. But in truth, I could find a home for all of them. Soo lovely to see the photos of you in your Mother`s vintage dress. it`s soo special. So glad you like this post, I was sure you would my Jojo! I also shared the link with the yellow dress because you told me you couldn’t find it 😉 I am expecting your favourites! Mine is the Balenciaga and all Zimmermann <3 Happy June! I agree with your choices. Balenciaga and Zimmermann have long been favotites of mine, too. Dreams ready to wear. I am also in love with the ASOS edition double layer maxi dress. It is so swishy. The Pretty Little Thing floral smock dress is soo cute. I love it to bits. Finally the Zimmermann mini dress is too pretty for words. Thank you dear Stella for such a wonderful post, full of dreamy ideas. This dress is stunning! Love all the pics! I love a floral maxi dress with long sleeves since I am always feel cold inside the AC operated indoor. 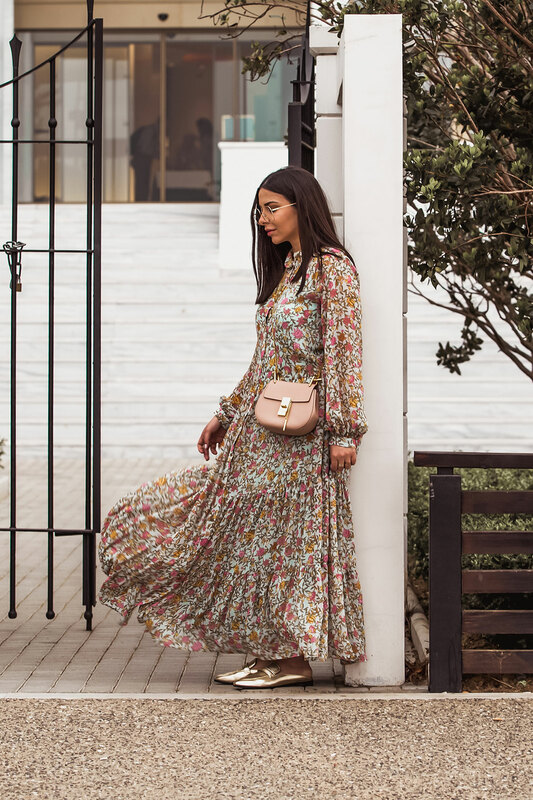 You rock this floral dress with these super chic golden tone slides. I love all the recommendation you pick, specially they are suite for people with different budget. I love that the dress is flowy and the print is beautiful. I love everything floral for summer. Such a beautiful dress. It looks so stunning on you! The Zimmermann dresses are my absolute dream! You look gorgeous btw! You look so beautiful and chic in this outfit, girlie! 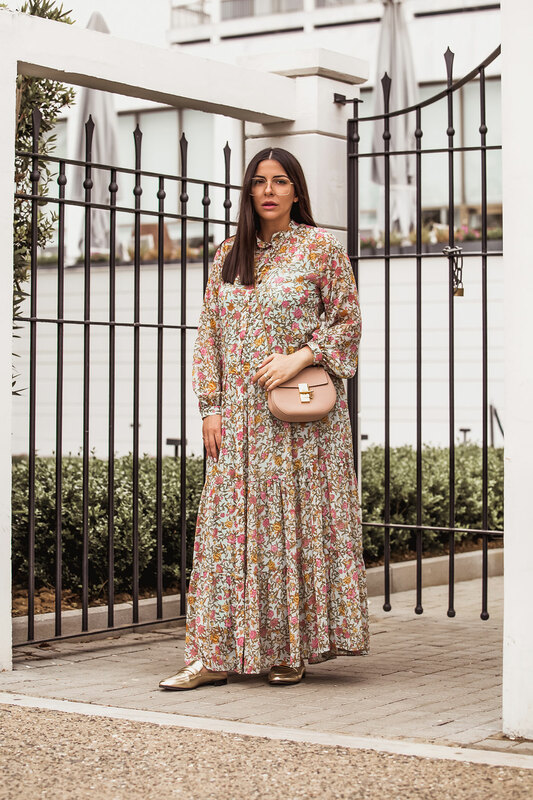 I love the floral maxi and the gold loafers paired with it. I have a pair myself and have yet to style it with a maxi, I’ll have to now. Thanks for the inspiration and I hope you have a great week ahead, beauty! You always find the best pieces from H&M! Love this dress on you. And some of those ASOS picks as well. You look gorgeous in this dress, Stella! Loving the selection of floral dresses also, very summer appropriate! 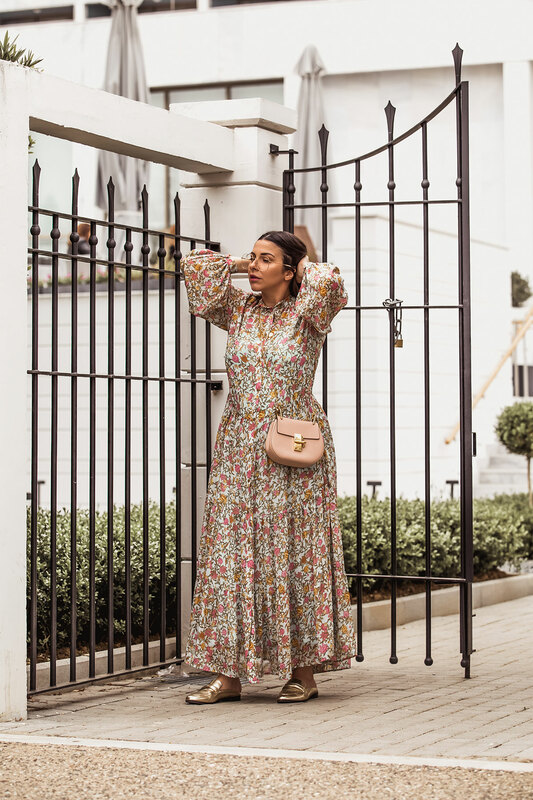 I love love love a good floral midi dress! So pretty! Gorgeous maxi dresses! I absolutely love the print and its vintage style. So gorgeous and breezy. Looks so comfy to wear. This floaty dress is absolutely gorgeous and suits you perfectly, love the floral notes with the golden touches! This dress is so beautiful and I love that you accentuate the gold with those fabulous shoes! The selection of floral dresses here are gorgeous. 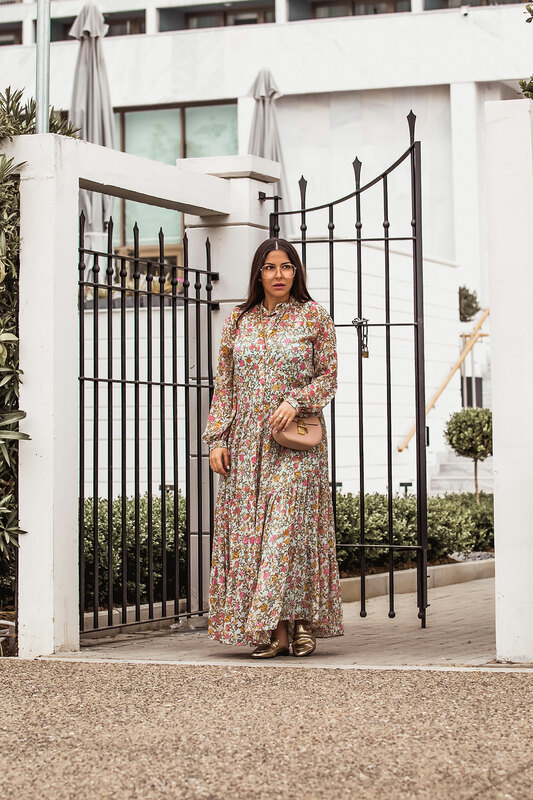 I always want to buy more maxi dresses and there are quite a few amazing ones here! Thanks for sharing darling! Have a great week. Kisses to you and DM.